This system is top-heavy in every way a system could be. The Bucs boast four of MLB.com's Top 100 Prospects in No. 19 Mitch Keller, No. 46 Ke'Bryan Hayes, No. 87 Travis Swaggerty and No. 96 Oneil Cruz, making them the first organization with that many to appear in these rankings. (Spoiler: They won't be the last. All but one team below has at least four.) Should shortstop Cole Tucker carry over his impressive bat from the Arizona Fall League, he could give Pittsburgh a fifth in the Top 100 when prospects from other systems graduate. The Pirates' depth falls off a decent bit from there, as they lack flashy prospects farther down the list. However, the group fits the other definition of top-heavy: eight of the top 11 prospects have already played Double-A ball or above. Those eight don't include Swaggerty, who could be a quick mover coming out of college. The Pirates will be locked in one of the game's most competitive divisions in 2019, and it'll help to have prospects like Keller and Hayes nearly ready to contribute. This is the Royce Lewis and Alex Kirilloff show. Everyone knows it. MLB.com's No. 5 and 9 overall prospects, respectively, were stalwarts for both Class A Cedar Rapids and Class A Advanced Fort Myers in 2018, and Minnesota fans should be salivating to see them start to climb together again. Lewis' combination of hit tool and speed (along with his potential to stick at short) and Kirilloff's overall bat would be welcome in any organization. With a plus-plus fastball and impressive slider, Brusdar Graterol (No. 68) is the system's other Top 100 representative. Nick Gordon and Stephen Gonsalves were once on that list, though both have fallen in recent years. Shortstop Wander Javier has a few above-average tools and could be a force after he shows he's fully recovered from a shoulder injury that kept him out for all of last season. Trevor Larnach and Brent Rooker are college hitters with some pop who could complement Lewis and Kirilloff nicely if everything clicks in the Twin Cities. Sure, it's the Lewis and Kirilloff show, but don't write off the rest of the talent here. Do keep in mind that there's only one other system (the Astros) with two top 10 overall prospects. This is a group that keeps rolling with talent. In another system, No. 35 overall Alex Verdugo likely wouldn't be a prospect at this point. He's been an impressive Triple-A hitter in each of the last two seasons, but logjams in the Los Angeles outfield have limited him to 100 Major League at-bats. Most farms would love to claim either Keibert Ruiz or Will Smith as their top catching prospect, and yet the Dodgers have both. With his plus fastball and curveball, No. 69 overall prospect Dustin May gives the Dodgers a pitcher to dream on. Fellow right-handers Tony Gonsolin, Dennis Santana and Mitchell White -- each of whom should join May at least in the upper Minors to open 2019 -- fill in nicely behind. Shortstop Gavin Lux will be building on a breakout 2018 that saw him hit .324 with 15 homers at Class A Advanced Rancho Cucamonga and Double-A Tulsa on his way to moving into the Top 100. DJ Peters' power can be as good as it gets in the Minors, and Jeter Downs and Josiah Gray were quality additions in an offseason trade. This system graduated Walker Buehler and traded away Yusniel Diaz in 2018 and yet still places comfortably in the top 10. The Reds had the fifth overall pick last year, and they took Florida third baseman Jonathan India. He enters the year as MLB.com's No. 53 overall prospect -- about right for the talented infielder who's yet to show what he can do over a full season in the pros. But he's only the fourth-best prospect in the Cincinnati pipeline. Nick Senzel is the obvious gem, at No. 6 overall; his bat is so good that the Reds are trying him out at center field this spring to get it in the Major League lineup quickly (perhaps as soon as Opening Day). Taylor Trammell has the starter kit of a promising outfielder, showing a good hit tool to pair with potentially plus-plus speed and a good glove in center. After a right elbow issue ended Hunter Greene's first full season prematurely, he's the biggest question mark of the Reds' Top 100 contingent. But when he's at full strength, his fastball can hit the upper-90s and even touch triple-digits with relative ease. Tony Santillan, who sports a plus-plus fastball himself, doesn't make for a bad second-ranked pitching prospect in any system, even if the mound talent falls a bit from there. The Reds have shown a real willingness to chase a playoff spot with their active offseason, but if it doesn't work out in 2019, their fans can have some confidence in the future cornerstones closing in on Cincy. How much credit should an organization get for one prospect? On the one hand, we should be hesitant to put too much importance on a single player while evaluating an entire system. On the other hand, it's Vladimir Guerrero Jr. And have you seen what he can do with one hand? The 19-year-old third baseman is the game's near-consensus top overall prospect, with hit and power tools that are each at least (at least!) graded out as plus-plus. His inevitable Major League debut could be the most exciting in a generation. His presence alone probably pushes the Jays into the top 10. It's the rest of the group that has the Jays sitting just outside the top five. As the No. 11 overall prospect, Bo Bichette would be the top guy in 22 other organizations because of his own promise at the plate. Likewise, Nate Pearson's triple-digit fastball would be the talk of most systems. Danny Jansen is Major League-ready as a good-hitting catcher at a down time for the position. Eric Pardinho, Jordan Groshans and Adam Kloffenstein are breakout candidates as they reach the full-season ranks. Kevin Smith and Cavan Biggio have already broken out. There's more than just Vlad Jr., but it makes sense to get really psyched about him. The Astros join the Twins as the only two organizations with two top 10 prospects -- they have No. 7 Forrest Whitley and No. 8 Kyle Tucker. Both should impact the Major League roster (in the rotation and outfield, respectively) at some point in 2019, as if the AL West favorites needed the boost. And the system gets deeper from there. Yordan Alvarez, Josh James, J.B. Bukauskas and Corbin Martin round out the Top 100 group, meaning all in the upper section are either gifted right-handers or outfielders with loud offensive tools. That's pretty desirable. It takes a while to discover a player on the Houston prospect list who isn't at least somewhat interesting. No. 11 Framber Valdez is legitimately competing for a Major League rotation spot. No. 16 Myles Straw is a plus-plus runner and major defensive asset in center field. No. 21 Luis Santana could be ready to break out further after hitting .348 with a 23/27 K/BB ratio for the Mets' Rookie Advanced affiliate in Kingsport. There are obviously more notable names in between. It's a good Minor League group for an organization that has grown accustomed to good Minor League groups for most of this decade. This is the last organization on this list that can truly have its depth questioned. What cannot be questioned by any means is Chicago's richness in top-tier talent. The South Siders claim the game's top outfield prospect in Eloy Jimenez, whose bat would be the most celebrated in the Minors if not for Guerrero. Michael Kopech is still seen as one of the game's best right-handed pitching prospects, even in a year that he'll miss due to Tommy John surgery. In his stead, Dylan Cease will be the righty to watch after ascending to the No. 21 spot in MLB.com's Top 100. Luis Robert has tools on the grass for days and just needs to be on the field long enough to show them off. The evaluations on Nick Madrigal can be mercurial, but there's no doubting the 2018 fourth overall pick can hit. (If he added a little power, all the better.) Dane Dunning has dealt with his own injuries but jumped to the No. 80 spot with an above-average arsenal and impressive control. Outside the mix of six Top 100 Prospects, the Sox are heavy on outfielders like Micker Adolfo and Blake Rutherford and hard-throwing righties like Ian Hamilton, Alec Hansen and Zack Burdi. There isn't much youth here -- Robert and Rutherford are the only top 10 prospects who will be 21 or younger on Opening Day -- and once this top group graduates, there's no clear batch behind them ready to take the mantel for the system. But for now, this cluster of prospect stars burns more brightly than the majority of others. It's been said plenty this offseason. But the offseason is basically over, so what's one more time? The Braves have eight Top 100 Prospects. Five of those are pitchers. Four of those pitchers (Mike Soroka, Kyle Wright, Touki Toussaint, Bryse Wilson) made their Major League debuts in 2018. Dig a little deeper, and No. 10 Luiz Gohara and No. 11 Kolby Allard also pitched at the top level at various times, helping Atlanta capture its first division title since 2013. Behind that group, there's another impressive set of arms, led by No. 32 overall prospect Ian Anderson, who finished 2018 at Double-A. Not only does this pitching group have talent, but it has thrived in the upper levels of the Minors and that should always be worth bonus points. The position players aren't quite as deep, but there are some standouts there as well, with third baseman Austin Riley and center fielders Cristian Pache and Drew Waters holding spots in the Top 100 and catcher William Contreras knocking on the door. The Braves were in the top spot here last year when they still claimed Ronald Acuña Jr. as a prospect. With the talented outfielder graduated, the shine comes off just a little. It's still easily one of the best three systems in the game. It (almost) doesn't get deeper than this. The Rays have graduated former top prospects Willy Adames, Christian Arroyo and Jake Bauers and yet their system is still strong as ever. Wander Franco has become The Next Big Thing after thrashing his way to a .351/.418/.587 line and 11 homers at Rookie Advanced Princeton as a 17-year-old in his first professional season. Ronaldo Hernandez developed into one of the game's most promising young catchers with some impressive pop and a great arm behind the plate. Those are just the guys who popped into the Top 100. Brandon Lowe hit his way to the Majors -- to the point where the Rays are trying to find him a defensive home -- and first baseman Nate Lowe was one of the Minors' top offensive performers in 2018. Tampa Bay also added promising pitchers Matthew Liberatore and Shane McClanahan in the Draft and 2017 first-rounder Shane Baz in the Chris Archer trade. 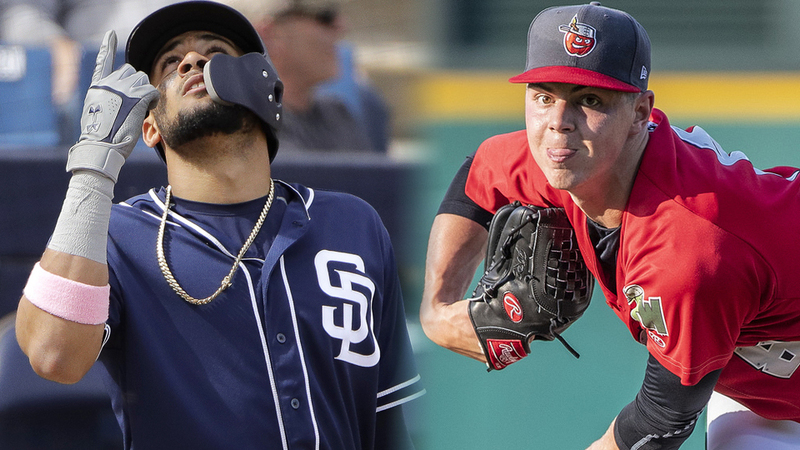 Among those who were major prospects this time last year, Jesus Sanchez is still a potentially gifted outfielder, Brendan McKay is still trying to make it two ways (although he'll stick to DH in 2019) and Brent Honeywell will return from his Tommy John surgery ready to show that his eclectic mix of pitches can dominate the Majors in the way it dominated the Minors before last season. Elsewhere, there are middle infielders poised to take off (Vidal Brujan, Lucius Fox), pure hitters (Nick Solak, Joe McCarthy) and dominant relievers (Colin Poche, Ian Gibaut). It's talented. It's diverse. It covers ground from the top of the Minors to the lower levels. This is an enviable system all around. And yet this is the most enviable system of them all. Ten Padres prospects rank among MLB.com's Top 100. That's the most of any organization. (The Braves are second with eight.) Put another way, one of every 10 prospects among MLB.com's Top 100 calls the San Diego system home. And it's not just the quantity that pushes the Padres into the top spot. There's the gem of the system in No. 2 overall prospect Fernando Tatis Jr. There's the No. 2 left-handed pitching prospect in MacKenzie Gore. There are the Major League-ready pure hitters in Luis Urias and Francisco Mejia. There is the MiLBY award winner for Best Starting Pitcher in Chris Paddack. There's the Texas League Pitcher of the Year in Logan Allen. There are the young arms -- all 20 or younger -- in Luis Patino, Adrian Morejon and Ryan Weathers. There's the No. 72 overall prospect who boasts three above-average pitches in Michel Baez. Outside of the Top 100 group, Josh Naylor, Hudson Potts and Austin Allen are all impressive hitters with Double-A experience. Buddy Reed's speed and outfield defense stand out everywhere he goes. Jacob Nix was up in the Majors after only 10 starts last season, and he's the No. 19 prospect in the pipeline. Edward Olivares showed enough tools (particularly when it comes to speed and defense) that the Padres felt the need to protect him from the Rule 5 Draft with a 40-man roster spot last November, and he's ranked a lowly No. 23. Consider only the players outside of the Padres' top 10, and it's still an OK system. But mix that depth with the best group of top talent in the Minors, and you have the best farm system in baseball in 2019.